Once, when I was little, my mom decided that we should try to make windows in our annual gingerbread houses by melting hard candies in spaces. This did not work out well. However, I decided to give these a try, this time, lining the baking sheets withoarchment to prevent sticking (a problem with the gingerbread). One of the great things about stained glass cookies is that they can be used to decorate Christmas trees. Simply poke a hole in the dough before baking (I used a needle) and then widen it a little bit when the cookies come out of the oven. Then you can run some thread through to hang them easily. 1. Whisk together flour and salt in a medium bowl and set aside. Beat together butter and sugar in a large bowl until pale and fluffy, then beat in egg and vanilla. Add flour mixture and mix until just combined. 2. Shape dough into 3 disks, wrap in plastic wrap, and chill until firm, at least 2 hours. Meanwhile, unwrap candies and separate by color in small heavy-duty Ziploc bags. Wrap the bags in kitchen towls and pound with a rolling pin to crush the candies. 3. Preheat oven to 350oF and line 2 baking sheets with parchment paper. Roll out one dough round to 1/8 inch thick on a well-floured surface with floured rolling pin. 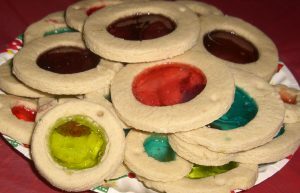 Cut out cookies with a large round cutter, then cut out centers (and throw into scrap pile) from those with a small round cutter and transfer to the baking sheets. Spoon about 1/2 to 1 teaspoon crushed candy in the center of each cookie. 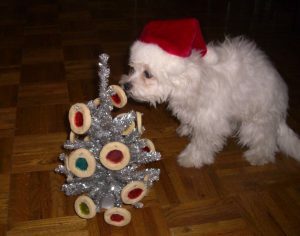 (If you want to use these cookies as tree ornaments, make a hole with a straw so that they can be hung later.) Refrigerate scraps and reroll. 4. Bake until edges are golden, 10 to 12 minutes, then cool cookies completely on baking sheet on a rack, about 10 minutes. Peel off of the parchment and store, separated by layers of parchment to prevent sticking.